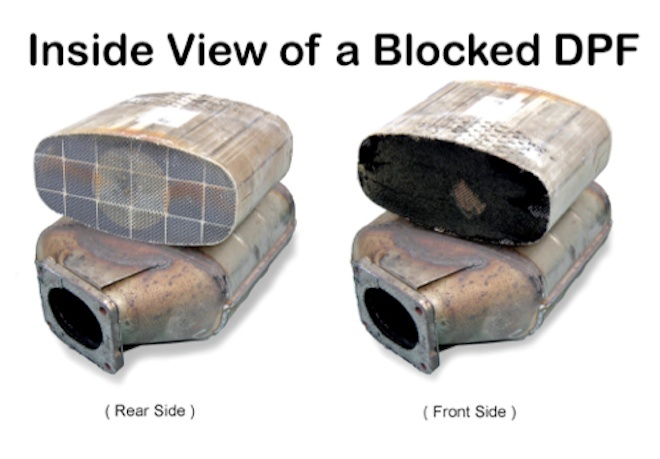 Blocked DPF filters in turbo diesels are without doubt one of the most common causes of turbo failiure and damage that we see on a day to day basis here at Turbopacs in Durham. So what damage can a blocked DPF cause ? 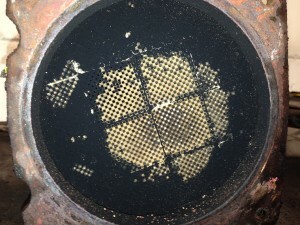 A DPF filter collects particles of ash, many of which become coated in varnish from fuel that is poorly burnt and from poor quality fuel….im sure you will have noticed how budget diesel can make a marked difference to the drive when you fill up ! usually in the negative ! The varnish causes the filter to become progressivly restrictive as the particles stick together and the back pressure in the exhaust system rises…we have seen 65psi ! So whats the problems with this then ? The compressor side of the turbo charger is designed to deal with pressure…NOT the exhaust turbine which prefers a low back pressure of between 2-4 psi. 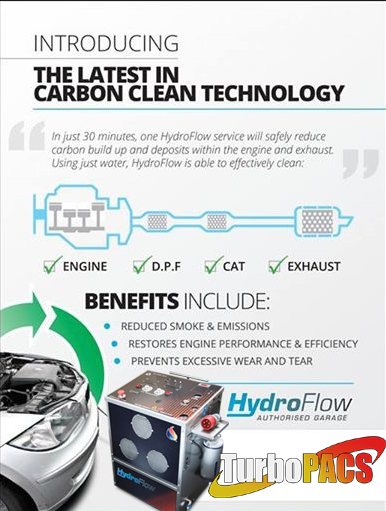 Once the exhaust turbine has been turned by the exhaust gases from the engine (rather like a water wheel) it serves no other purpose and then passes through the vehicles catalytic convertor (if it has one) and then through the DPF filter. As the dpf becomes more and more restricted as it collects ash particles the back pressure increases and eventually this causes hot exhaust gases to breach the oil seals in the turbo and then enter the turbos core which contains the oil that lubricates it…needless to say this is not good as the exhaust gases are around the 6-700 degree mark ! The hot exhaust gases carbonises oil onto the turbo seals which are meant to keep the exhaust gases and oil apart which from that point on will leak oil. In simple terms your turbo has begun the process of failing even though it will boost. Over time smoke will appear, the turbo will start to make noises when boosting etc and the leaking oil makes the blocked dpf even worse in terms of back pressure…we have even seen cats becoming blocked because of the oil leaks. Engine management lights will start to apear and performance can be effected too. These symptoms will continue until the turbo charger fails all together because of the blocked dpf OR the engine management detects and unacceptable back pressure through one of its pressure differentials which measure pressure before and after the dpf filter. Once this is detected the engine management system will usually place the vehicle into limp mode and try to “regenrate the DPF…which means try to clear the blockage which in turn causes additional back pressure issues and reduces the turbos life span even further. When this limit is reached the vehicle will usually loose power and be put into whats terms as “limp mode” or restricted performance with fault codes showing blocked dpf related fault codes. The classic mistake is then to have a new DPF filter fitted or have the blocked dpf removed altogether. So whats wrong with that then ? The increasing back pressure has actually been holding the leak “back”…now that the back pressure has been reduced by dpf replacement or removal…theres nothing to control the leaking oil and its common that shortly after having this “repair” completed the turbo fails completly with oil entering the induction system…in many cases causing diesel run on, possible engine failiure, a much larger repair bill…and if this happens its rather scarey !